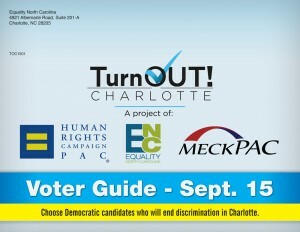 Mailers for the TurnOUT Charlotte! get-out-the-vote campaign began arriving in local voters’ mailboxes on Thursday. The coalition effort from the Mecklenburg LGBT Political Action Committee (MeckPAC), Equality North Carolina and the Human Rights Campaign hopes to combine voter outreach through mailers, phone banking, canvassing and other activities. Their goal is to turn out LGBT and ally voters for Charlotte’s Sept. 15 primary (early voting is open now) and elect a mutually endorsed slate of at-large and district City Council candidates. Endorsees include at-large candidates Julie Eiselt, Vi Lyles, Billy Maddalon and James “Smuggie” Mitchell. District candidates include Al Austin (Dist. 2), LaWana Mayfield (Dist. 3) and John Autry (Dist. 5). Several questions to local Human Rights Campaign organizer Ryan Rowe weren’t yet returned. It’ll be interesting to find out how many of these mailers were sent, if they were targeted to any particular portion of town or if the three organizations simply combined their membership lists and targeted their members and supporters. I’m inclined to believe it’s the latter, but I don’t know. I do know that my full name was printed on the mailer I received, and my full name, at least as far as I’m aware, has never been included in these groups’ member/supporter lists. It leaves me to believe they’re relying, at least somewhat, on local voter rolls, even it’s just to cross-check, confirm or identify supporters’ addresses. The numbers are important. As I noted yesterday — totally unscientifically — there could be as many as nearly 20,000 LGBT voters in Charlotte. The number of LGBT and ally voters would be far greater than that. 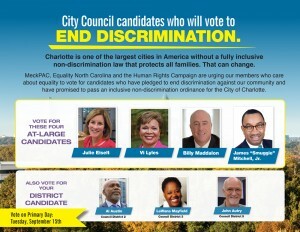 The campaign’s messaging is strong and clear — vote for these candidates who will support non-discrimination. 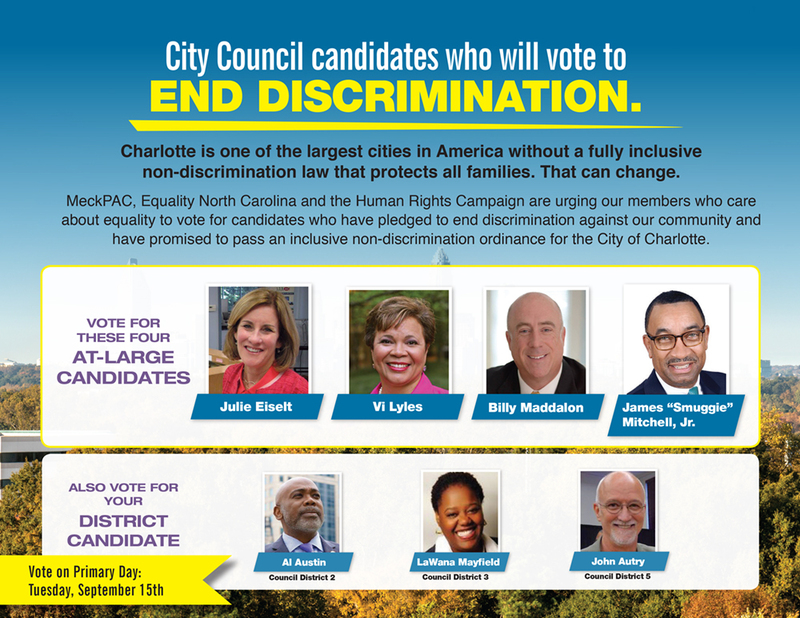 The mailer clearly makes a partisan call to action, stating: “Choose Democratic candidates who will end discrimination in Charlotte.” And it’s true. All of the endorsed candidates are Democrats. And the campaign needs to convince unaffiliated voters directly to choose to vote in the Democratic primary. That’s where the most effect will be seen and from where we’ll see likely future Council members emerge. Discrimination against whom, exactly? The words “lesbian, gay, bisexual and transgender,” “LGBT,” “sexual orientation” or “gender identity” appear no where on the mailer. The latter point above — the exclusion of specific LGBT terminology — is less important if the groups are directly targeting their members and supporters. LGBT and ally supporters of each of these three groups should be more aware of recent debates over the spring’s LGBT-inclusive non-discrimination ordinance. But not everyone is — and not just well-intentioned, but not-so-well-educated allies. I’ve repeatedly heard over these several past months that even some within the LGBT community have continued to be confused over the ordinance, what it included, what the contention was and, most chillingly, why a compromise, trans-excluding package wasn’t acceptable. These concerns point back to what I and others have repeatedly said since late last year — the original ordinance campaign needed a strong and strategic public education, awareness and mobilization campaign. I think everyone understands that now. TurnOUT Charlotte! is engaging in the awareness and mobilization, and there are few individuals and groups — activist Paige Dula and her wife, along with Time Out Youth and Charlotte Pride’s Trans* Pride Committee, for example — who are engaging outreach and education efforts. [Disclosure: I am a member of Charlotte Pride’s board of directors.] But our current education efforts (I won’t call them strategies or campaigns) probably aren’t enough and we’re probably not reaching a large enough mass of uninvolved LGBT people and those well-intentioned allies upon whom we depend for their votes and support. 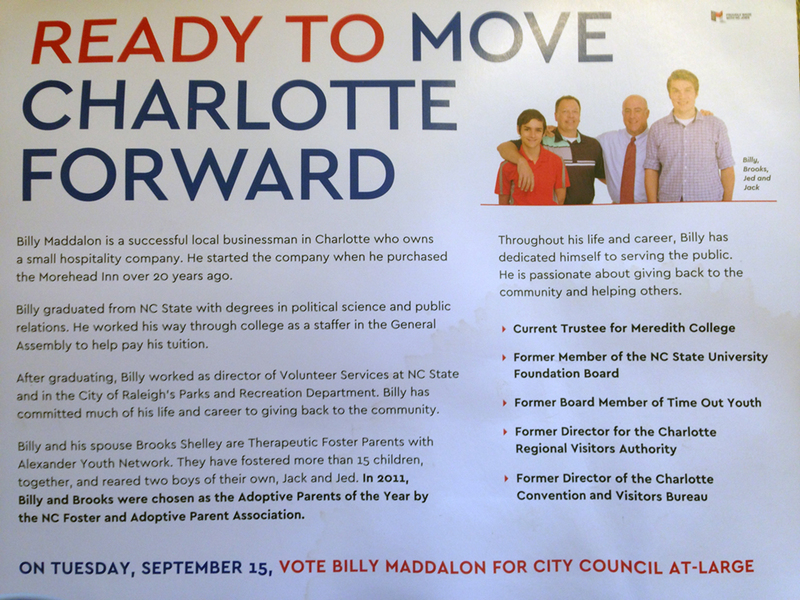 Candidate Billy Maddalon has his own campaign mailer. It might be, I believe, the first time a member of the LGBT community has used a photo of their family in local campaign literature. It’s a positive sign that Charlotte, despite our continued flaws, is moving forward and that our community’s candidates can be as open and affirming of their families and lives as straight candidates can. Billy and his spouse Brooks Shelley are Therapeutic Foster Parents with Alexander Youth Network. They have fostered more than 15 children, together, and reared two boys of their own, Jack and Jed. In 2011, Billy and Brooks were chosen as the Adoptive Parents of the Year by the NC Foster and Adoptive Parent Association. Read more about Billy, Brooks and their son Jed via People Magazine. Typical HRC mailer – no mention of LGBT – much less the words we identify spelled out. Also, why endorse a mayoral candidate if they are not on your mailer slate of candidates? Did I miss something? TurnOUT did not endorse in the mayoral race. Neither did HRC. Only MeckPAC and ENC.